Need a convenient and discreet way to get your urological supplies? Let Shop Catheters provide you with all your catheter needs. ShopCatheters.com is a dedicated online store for all urology and catheter supplies. With years of experience, ShopCatheters.com is committed to provide our patients with superior service and convenience that will enhance their quality of life. We strive to focus on our customer needs by supplying high-quality catheter supplies right to your door discreetly at very affordable prices. Our inventory is always competitively priced, so you no longer have to wait around for a sale. When you buy catheter supplies online from ShopCatheters.com you can be sure get the best deal. You can skip the hassle of ordering urinary catheter supplies every month by signing up for one of our subscription plans and receive additional savings! Just sign up for our "Auto-Reorder" program and get your urinary catheter supplies delivered at 5% discount every 30 days - or as often as you need them. We designed Shopcatheters.com to be extremely user-friendly. Some of the site’s great features include separate filters for catheters for men and women, easy ordering, catheters buying guides, informative articles on urinary catheters uses, types, and complications, detailed product descriptions and auto reorder plans. You can easily view order history and save your favorite products. Our website is easily accessible from mobile phones, computers and tablets alike. Our customers have access to urology and catheter supplies from the leading brands that you know and trust. 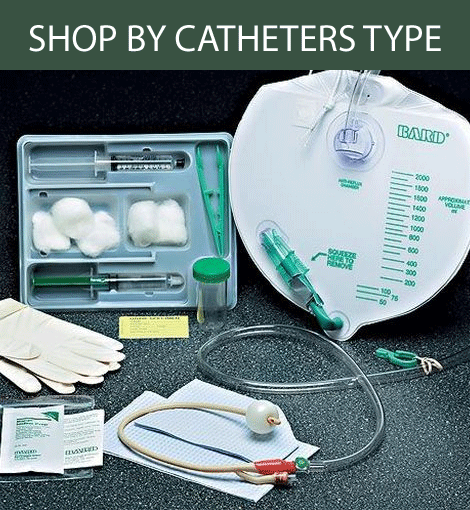 We carry catheter supplies from Bard, Cure, Coloplast, Rusch, Hollister, Rochester, Amsino, Cook Medical, Kendall, Medicath, Medline, Reliamed, Teleflex and more. With ShopCatheters you can be certain you’re using the products best suited for you and your lifestyle. Shopcatheters.com has built a solid reputation with our customers and physicians as a reliable resource to help them meet their catheter and urology needs. As part of our extensive inventory, we are happy to offer urological supplies including Intermittent Catheters, Foley Catheters, Suprapubic Catheters, Closed System Catheters, Antibacterial Catheters, External Catheters, Hydrophilic Catheters, Straight Tip Intermittent Catheters, Coude Tip Catheters, Sterile Closed Catheter Systems, Sterile Lubricants Intermittent Catheters, Male External Catheters, Female Catheter, Hydrocolloid Catheter, Hydrogel Catheter, Hydrophilic Catheter, Pediatric Catheter, Beside Night Drainage Bags, Catheter Insertion Kits, Leg Bags and catheter accessories from some of the top-name brands in the market.